Wasnt really planning a evening out, but around 6pm, I had a text from Darren Wragg who asked if I was going to Blidworth, he kindly picked me up at around 7.20pm and we arrived the Welfare Ground with about 10 minutes before kick off. Had a chat with Scott Ward and Chris Wain and a hopper who has moved in to the Mansfield area up near the tea bar which is situated overlooking the pitch. 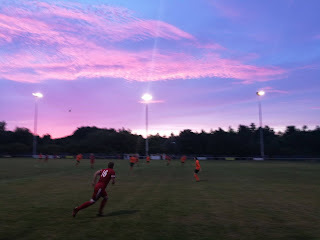 The game kicked off and it was quite even, though Flowserve were having the better of the chances and infact on 24 minutes they had a shot hit the underside of the bar and the follow up was headed home, but to no avail as the Assistant Referee had his flag raised. On the half hour, Blidworth took the lead when the opponents failed to clear the ball from their area and TONY EDWARDS struck home from around the penalty spot area. At Half Time, I strolled down to pitchside and had a chat with local legends Malc Storer and Kev Goodman before joining Flowserve;s Secretary Zoe, plus David Hurstfield and Mr Rhodes. We certainly didnt have to wait very long for Welfare to double their lead, as around 48 seconds in to the second half, TONY EDWARDS cross shot deceived everyone and nestled in to the corner of the net. Flowserve made a few subs but didnt look like getting back in to the game and on 60 minutes, things went worse when the goal of the game was scored by AARON PRIDE who lofted his shot over the keepers head to make it 3-0 to the homesters. In the 69th minute, the team from Newark got on the scoresheet, when a JACK KETTRING;s corner swept in to the net. On 85 minutes, Flowserve thought they were back n the game to set up a exciting finish but again a goal for them was disallowed for offside. A very good match which was a good run out for both sides.